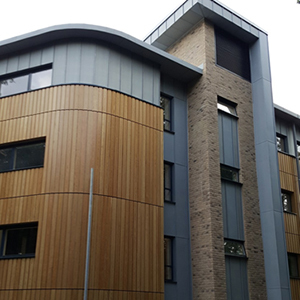 Richardson Roofing believe this project deserves recognition because not only does the Falzinc cladding look pleasing in its own right we feel it is complemented by the adjacent natural timber cladding. We also feel the installation of 3,500m2 of Falzinc within a 20 week period is a substantial undertaking when a good proportion of the work is in isolated areas on 5 different buildings. While appearing to be a standard wall cladding and roof covering project there were a few technical challenges generated by some challenging architectural details. In particular the 90 degree hips to the flat roofs. 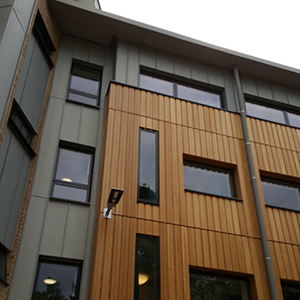 With the standing seam adjoining the solid core wood roll hips multiple thicknesses of Falzinc were required to be turned up the batten. In the colder months this proved a challenge but was overcome by the use of hot air guns. The height of the building was such that the scaffold had to be tied to the building at regular intervals. The ties were often located within the Falzinc cladding zone and co-ordination of scaffold with the progress of works often required great care. The level of workmanship achieved on the project was exceptional from the start. Richardson placed their very best tradesmen on the project and the quality shines through in the photographs. The quality of setting out and alignment of seams with adjacent architectural features throughout the project is paramount in achieving an excellent overall appearance. The building design included a number of inverted narrow areas which required vertical cladding. The scaffold contractor could not erect a standing scaffold in some of these locations and works had to be completed from hydraulic working platforms. The correct use of correct PPE was employed at all times. The site specific rules required all operatives to wear safety gloves and glasses as well as hard hats, boots and high visibility vests. Although not particularly exposed, the site encountered a period of high winds and great care was taken to tie down prefabricated sheets. Brick guards were also employed to prevent small pieces of metal falling from scaffold during the installation. 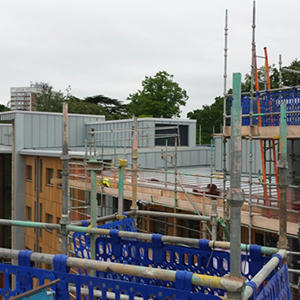 On this particular project Richardson were not installing the timber substrates and were totally reliant on the preceding carpentry contractor to make the works available on time. On a number of occasions it became apparent that works were not going to be available in accordance with the agreed programme. 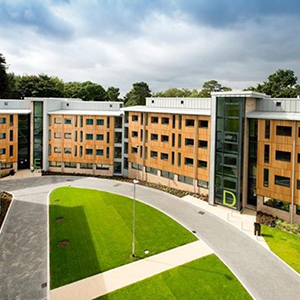 The main contractor on the project had a tight deadline for the project as the halls were due to be populated by students for the September 2016/17 term. With a delayed start this caused a severe stretch on Richardson’s skilled labour resources. 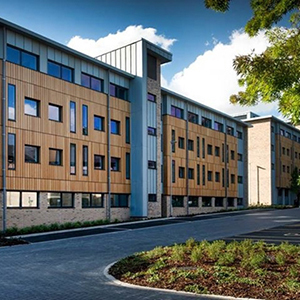 By working evenings and weekends the works were eventually completed on time with the students moving in on time.